Pointcorp is planning to build 42 prestige residences next to the iconic Torbreck, Brisbane’s first highrise residential tower. 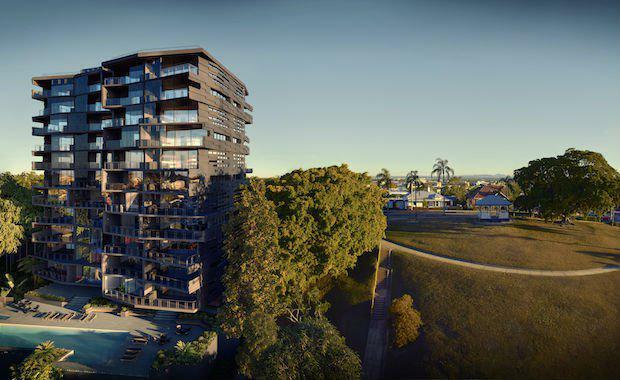 The luxury development is The Highgate, located on Dornoch Terrace in Brisbane’s Highgate Hill and will offer many of its own firsts. Described by its lead architect as a “building in a garden”, The Highgate will take up less than 20 per cent of its site, a rarity in apartment living. Pointcorp director Chris Vitale said the north east facing site, situated 60 meters above sea level and within a two kilometer radius of the CBD, had arguably the best views in Brisbane. Mr Vitale said the $70 million development is being undertaken at a time when Brisbane’s prestige property market is rebounding. “There are so many special things about The Highgate from its never to be repeated location, to the range of talented people we’ve worked with,” he said. One of the development’s most distinctive features is the use of the 4,900 square metre site. “While most apartments are in an urban environment, The Highgate is in its own unique environment,” he said. Cottee Parker designed building will be eight storeys high, taking full advantage of the site with its spectacular city views. For the first time, “The Highgate” will feature the first private kitchens designed by Australian chef, author and television presenter Neil Perry. Perry said his vision was to create an aspirational living space, with the kitchen as the centre piece. “Cooking should be about enjoyment so it was paramount the kitchen design focused on functionality throughout, while still incorporating a sense of luxury. In another first, The Highgate will be the first apartment project in Australia to feature Neil’s new appliance range from Neil Perry Kitchen By Omega. “It’s responsive, powerful and easy to clean which is important in my kitchens. I want people to feel they are in a space they are proud of,” he said. Architect Sandra Browne from Cottee Parker, with previous projects including Emporium and Portside Hamilton, brings 25 years of experience to The Highgate. She said the concept for The Highgate started with the idea of a luxurious home in the sky. With a mix of 3 bedroom and penthouse apartments, every unit will have its own lift, opening directly onto a lobby to promote a sophisticated, hotel-type feel. “It’s a very simple, elegant design that respects its neighbours,” she said. The façade features a rich material palette with dark tinted glass and will be made of Glass Reinforced Concrete with floor to ceiling glazing. Ms Browne said each apartment was orientated to take full advantage of the spectacular city skyline. Blainey North, whose design studio specialises in sophisticated, bespoke design. Their brief was to make residents feel like they were living in the presidential suite of a 5 star hotel. “True luxury design involves a precise touch and a fastidious attention to detail and that’s what we’ve done with The Highgate,” Blainey said. The winner of the 2013 International design excellence award, Blainey brings her experience from projects throughout Australia and overseas to deliver a vision of high end luxury. The sense of luxury and uniqueness doesn’t stop inside. Landscape architect Steve Dunn has designed a lush, private garden on the 4,900m2 site which he calls an urban oasis with a “wild twist”. A formal courtyard connects to the entry through a vine-covered arbour. The upper garden contains a formal entertaining area and lawn terrace with views to large tree canopy, home to many different types of birds. A circular staircase connects to a lower “secret garden” comprising of a pool, informal terrace and creek bed with wild planting and a fire pit. “It’s a wild experience within an urban environment,” Steve Dunn said. While landscaped areas in apartments are often small, left over, or almost an afterthought, this garden is the focus. “These garden spaces will be generous, integrated, private and light-filled,” he said. Building is expected to start in February 2015, with apartments starting from $1.5 million.